LONG Island have kicked off their two dayer against Crib Point in style, batting out the first day to post a huge total of 9/245. Long Island’s opening three batsmen kept the runs ticking over, but a brilliant fourth wicket stand of 105 runs between Michael Burke and Brad Bailey helped them to a fantastic position. Bailey batted brilliant to post 75 runs. At the close of play for the day, Long Island ended up at 9/245 off 80 overs. Glenn Barclay was the pick of the bowlers, taking 2/38 off 22 overs. Crib Point will have a very difficult task ahead of them to salvage the match, especially given they sit bottom of the ladder. 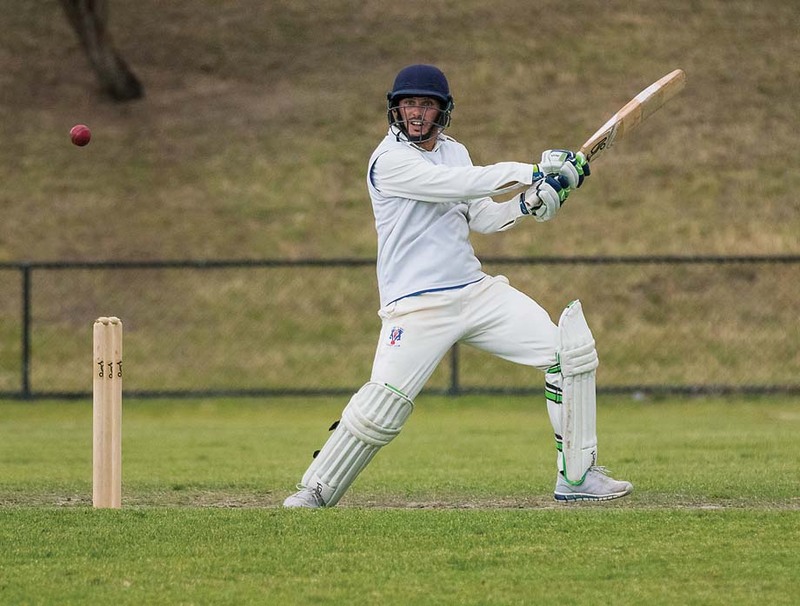 Moorooduc relied on opener Ben Williams’ score of 60 in their opening innings at Eric Bell Reserve to help them to a final total of 154 against the Pines. Williams received little help from his batting partners, as they all toppled alongside him for less than 15. Williams eventually fell with his side at 4/63, and the tail chipped in to held them to a defendable total. Pines’ run chase was dealt a blow in their four overs at the crease before the close of play, after Moorooduc’s Robbie Lancaster claimed an early scalp to leave the home side at 1/4 . Baden Powell will face Somerville in a two day clash. Main Ridge will battle Red Hill in a two day clash. DELACOMBE Park will go into the second day of their clash against Carrum with a very handy lead. Jonathan Guthrie’s opening run stand of 80 set the tone for a fantastic innings, as Delacombe Park ended up all out for an impressive 224. The tail performed especially well, as, as they recovered from 5/117 to post a very impressive total. Captain Ricky Ramsdale put together an entertaining innings in the middle order, smashing two sixes. Jake D’Atri can hold his head up after taking four wickets, including the prize scalp of Guthrie caught and bowled. Carrum came in to bat to close the day out and finished at 0/10 off five overs. Seaford will be disappointed after a complete capitulation against Seaford Tigers, which left them bowled out after just 35 overs. Seaford’s opening four batsmen in their crosstown derby combined for only 14 runs, leaving the middle order to salvage something from the innings. Dil Pageni top scored with 22, and Seaford were left bruised and battered all out for 91. Matthew Roach was damaging and economical with the ball, claiming 3/18 off nine overs. Seaford Tigers also saw a number of wickets fall early, and were left struggling at 5/47. Matthew Roach came in to bat and again saved the day by posting 74 runs, including a six, to guide the Tigers to 8/199 at the close of play. At Thomas Barclay Oval, Heatherhill have started strongly and posted a good total against Hastings. Heatherhill’s tail let down good performances from the top order, as they finished up all out for 175 from a little under 74 overs. Luke Hewitt took 4/29 off his 15 overs. Hastings came in for their innings and batted well over six overs to finish the afternoon at 0/13. Mt Martha are set to take on Rosebud in a clash that will end next Saturday. TYABB have got off to a superb start away from home in their two day clash against Dromana. Nick Taranto opened for the Yabbies, and put together an unbelievable performance to set his side up for a huge total. Taranto raised the bat after passing his century, knocking 16 fours to the boundaries and a six as well. He was eventually dismissed for 127, but the damage had well and truly been done. Dromana will have a big task next week to catch up. Skye have made a meal for their first innings against Boneo, with their opponents passing their target with ease on the first day of play. Glen Petersen posted figures of 3/6 as Skye fell for a paltry 57 from 42 overs. Boneo battered Skye, posting 5/232 off just 38 hours, setting themselves up to take both innings. At Peninsula Reserve, Jason Bedford put together a captain’s knock in the middle order to help his side to 156 all out against Balnarring. Bedford hit three sixes and five fours to post a total of 67. His wicket was the last to fall at the end of the 63rd over. Balnarring’s run chase hit an early speed bump with the loss of their opener, but they settled to make 1/26 from 16 overs. Andrew Kiston bowled six overs before stumps, impressing to take figures of 1/1. Tootgarook are set to take on Carrum Downs in their two-dayer. Rye, who are not flying high after losing five on the fly, have a bye. A FANTASTIC team performance by Langwarrin has seen them finish at 246 at stumps in their clash away from home to Mt Eliza. Six Langwarrin batsmen posted totals above 20, with Taylor Smith raising the bat for a half century. The Redlegs will have to work hard to get near the target on day two of their clash. At Harry MacDonald Oval, Peninsula Old Boys have got off to a good start in their run chase against Pearcedale. Pearcedale won the toss and elected to bat first, with Matt Cousland top scoring from the number three position with 46 runs. James La Brooy was good with ball in hand for OB, taking 4/39 and doing particular damage to the tail. Old Boys had 11 overs to make a dent in their target, and performed well to end up at 0/44 at stumps. Josh Swainston was expensive from his three overs, conceding 21 runs. Alexandra Park played host to Mornington and and Sorrento in the first day of their two day clash. Sorrento opened the batting and were left shocked after losing their two opening batsmen for just 5 runs each. They continued to struggle until a huge middle order partnership of 124 runs between Liam O’Connor and Chris King helped the Sharks recover to make 205 all out. Their last six wickets were lost for just 11 runs. Rueben Higgins tore through the tail end, claiming 5/12 off less than eight overs. Mornington batted six overs before stumps, finishing at 0/12. Flinders’ match against Baxter got off to a rough start as their opening innings was brought to a close for just 76 runs. Chamika Sattambi raised the ball with a five wicket haul. Daniel Warwick top scored for Baxter in their subsequent innings with 57 runs to help Baxter claim the first innings. They declared at 3/101. Flinders are in danger of losing both innings in the second day, as their eight overs to close the day saw them finish at 2/9.